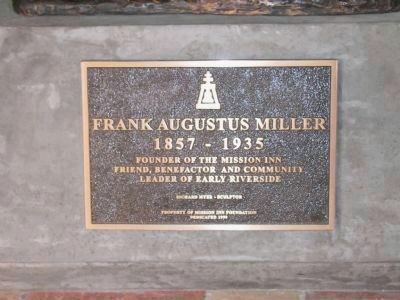 Frank A. Miller (1857-1935) made adobe bricks for a small 12 room guest house which he opened in 1876. 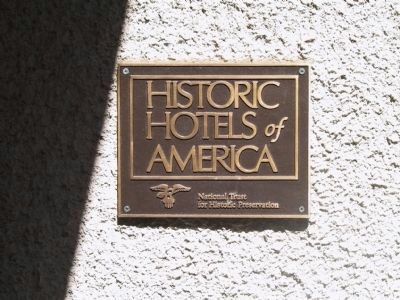 Over the years by successive building additions he fulfilled his dream by recreating this early California Mission style setting of a hotel. Marker series. 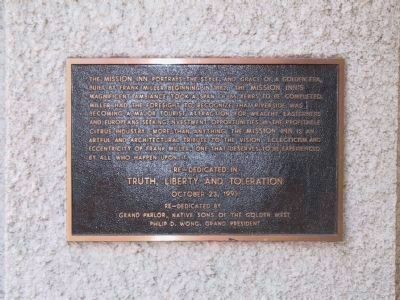 This marker is included in the National Historic Landmarks, and the Native Sons/Daughters of the Golden West marker series. Location. 33° 58.985′ N, 117° 22.37′ W. Marker is in Riverside, California, in Riverside County. 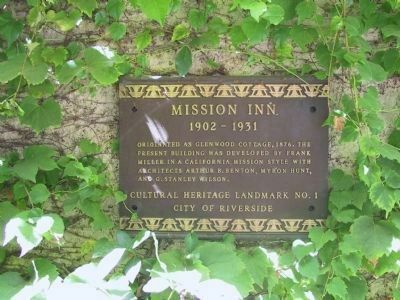 Marker can be reached from Mission Inn Avenue, on the right when traveling west. Touch for map. 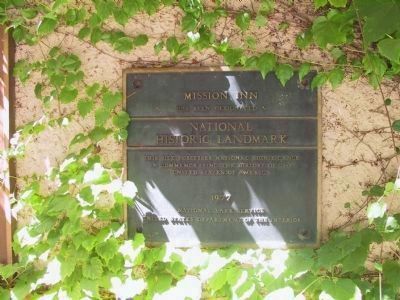 Marker is located near Las Campanas Restaurant on the Mission Inn grounds. 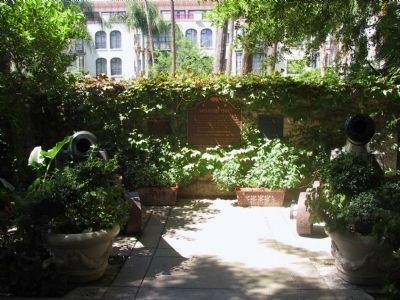 Marker is at or near this postal address: 3649 Mission Inn Avenue, Riverside CA 92501, United States of America. Touch for directions. (approx. 2.6 miles away); Highgrove Hydroelectric Plant (approx. 2.7 miles away); The First Marsh Grapefruit Trees into California (approx. 3 miles away); Parent Washington Navel Orange Tree (approx. 3 miles away); De Anza Crossing of the Santa Ana River (approx. 4 miles away); Agua Mansa Cemetery (approx. 4 miles away). Touch for a list and map of all markers in Riverside. Originated as Glenwood Cottage, 1876. The present building was developed by Frank Miller in a California Mission style with architects Arthur B. Benton, Myron Hunt, and G. Stanley Wilson. 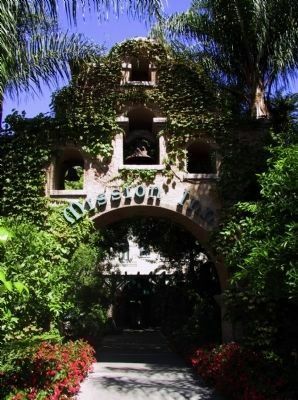 The Mission Inn portrays the style and grace of a golden era, built by Frank Miller beginning in 1882, the Mission Inn's magnificent ambiance took a span of 66 years to be completed. 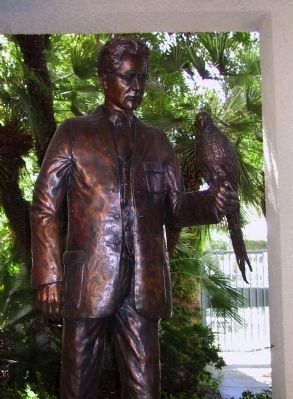 Miller had the foresight to recognize that Riverside was becoming a major tourist attraction for wealthy easterners and europeans seeking investment opportunities in the profitable citrus industry. 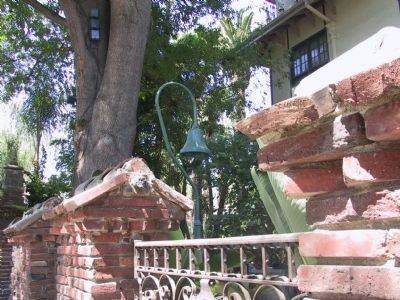 More than anything the Mission Inn is an artful and architectural tribute to the vision, eclecticism and eccentricity of Frank Miller; one that deserves to be experienced by all who happen upon it. More. 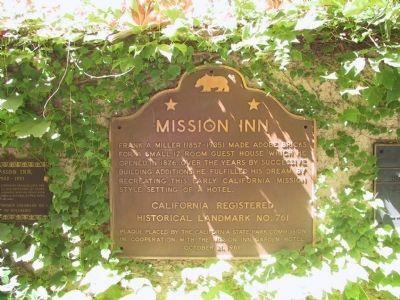 Search the internet for Mission Inn. Credits. This page was last revised on June 16, 2016. This page originally submitted on December 27, 2011, by Michael Kindig of Long Beach, California. This page has been viewed 767 times since then and 17 times this year. Photos: 1, 2. submitted on December 28, 2011, by Michael Kindig of Long Beach, California. 3. submitted on January 1, 2012, by Michael Kindig of Long Beach, California. 4, 5. submitted on December 28, 2011, by Michael Kindig of Long Beach, California. 6, 7, 8, 9, 10. submitted on January 2, 2012, by Michael Kindig of Long Beach, California. • Syd Whittle was the editor who published this page.